I wrote a news piece about A Dark Song a few years ago, and then promptly forgot all about it. I remembered that it sounded intriguing though, so when I was flicking through the TV guide and saw that it was showing on Film Four, the penny dropped and I might well have gone “Ooooh!” into the bargain. Well, I watched it this afternoon and I’m very pleased that I did. It’s a cracking horror film, in most of the ways that I enjoy. Solomon (Steve Oram), an occultist that she wants to employ to help her perform a special ritual, one that will give her something that she wants, and she is willing to pay tens of thousands of pounds for the privilege. She isn’t totally honest with the blunt man, but after securing his services, the slow build of the film begins. This brings me to the first thing that impressed me. Many occult horrors gloss over much of the tedium and legwork needed to perform whichever ritual is needed correctly. 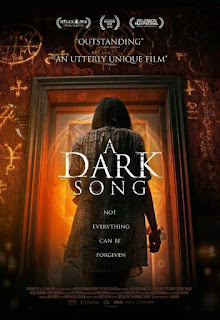 Not so A Dark Song. From the diet and food provisions, to the salt circle and purifications needed, the first half of the film is steeped in interesting observances and dogmas. That’s not to say that there aren’t any signs of paranormal entities taking notice. There are, but these are quite subtle, more unnerving than horrific. Strange synchronicities, quiet scratchings, stuff about as far removed from the jumpscare-fests that many horrors turn into as you can get. and Joseph, from his grim, sweary manner and humour, to her generally annoying attitude and paranoia. The film made me chuckle out loud in a number of places, usually with Joseph being very blunt, or making semi-frequent use of the C word. Two people stuck in a house together for months on end; the grinding on each other's nerves is a fascinating thing to witness. The house itself is practically another character, the large rooms and creaking wood floors framing the exchanges between the two occupants in a kind of shabby gothic lens. The second half of the film is when things turn to their darkest, with events not quite going to plan, lies emerging, and the atmosphere thickening so much that you could stir it with a spoon. Even here though, the film is still the less bombastic side of horror, even the moments of mild gore fairly tame by most standards. Things do escalate at the end, but even there, the final scenes did seem to sit nicely at the apex of tension that had been built up. I guess that’s a wordy way of saying that I didn’t think things went too far. The ending, when it came, felt suitably strange, but also a little disappointing. It wasn’t so much the manner of what happens, but the route Sophia decides to take after. I just didn’t buy it, to go through all that she did, to choose the outcome that she opted for. It felt twee if I’m honest, and I don’t really like twee. I also didn’t feel I’d seen enough changes in her throughout the film to warrant such a direction. It felt like watching someone embark on an epic journey, only to turn back for home inches from the destination, having decided that actually, they would rather be at home. As with most things though, it’s probably a matter of expectation and taste, and I won’t let my disappointment with the ending mar what I thought was a fantastic film. A Dark Song, taken as a whole, really impressed me. I liked the spiky characters, the occult mystique and the attempt to portray the drudgery that grand magick would entail. The supernatural elements escalate nicely, the slow simmering at the start coming to the boil in a pleasing way at just about the right time. I wasn’t scared during this horror, I don’t remember when a horror last made me feel afraid. I was more a tourist of uneasiness, able to vicariously enjoy the tensions of the characters that the film portrays, and I will take that over cheap jumpscares any day. If you’ve not seen A Dark Song, it’s one to keep an eye open for.